The DC4030PR has 30 well thought out stitches. Included in the stitches are 6 one step buttonholes that sew a buttonhole exactly for your size button. Best of all the machine has stitch elongation which allows you to stretch a decorative stitch by up to 5 times its normal length without losing density. Direct Stitch Selection Buttons – Push the button once, and the green light shows the left stitch pictured on the button is selected. Hit the button again and an orange light indicates the right stitch on the button is selected. The letter on each button advises you what foot to use. Janome’s 7 Feed Teeth Box Feeding System assures Superior Feeding! From the lightest weight fabric to heavy fabric! The DC4030PR has a bright LED Screen for easy view of stitch width and length. Easily adjust the stitch width or length by just pressing the plus or minus button. The Automatic Needle Threader is simple, just pull down the needle threader, put your thread in the hook and in front of the needle, pull back and your needle is threaded! The bobbin cover is see through to let you see if you are running out of thread! In addition, if you sew of the edge of the fabric it is jam proof. Free motion quilting to old fashion darning is easy with the drop-feed system. Do pants legs and shirt sleeves with the Free Arm Feature! 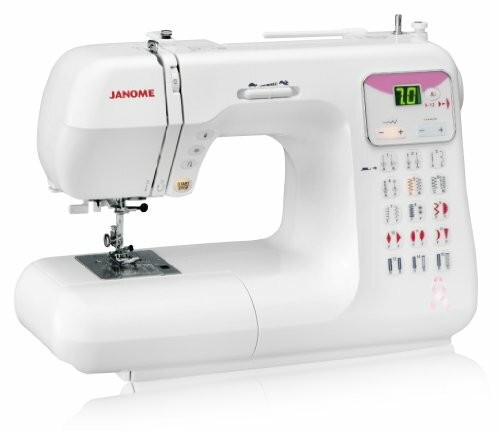 Janome’s Superior Automatic Tension gives incredible results on all your projects. Adjustable Presser Foot Pressure allows you to adjust the pressure on the fabric. This allows for sewing on a greater variety of fabrics. Handy Central Control Buttons: From bottom to top: Start/Stop (and slow run), Reverse, Lock Stitch, Needle Up/Down all conveniently located for your sewing pleasure. Just push the bobbinwinder to the right and the auto-declutch will automatically stop the needle from moving and wind your bobbin! The Start/Stop button allows you to sew without using the foot control! Start-Stop Button Allows you to Sew Without a Foot Control, Auto-Declutch Bobbin Winder, Easy Reverse Stitch Button and Precise Thread Tension! Easily Select One of 30 Built-In Sewing Stitches with the Front Stitch Panel and LED Screen / Adjustable Presser Foot Pressure Allows for Sewing on a Greater Variety of Fabrics! Bright Two-Digit LED Screen For Simple Stitch Selection, Superior Feeding System and Drop Feed Capable! Automatic Needle Threader – Easily Adjust Stitch Length and Width with the Touch of a Button, Free Arm Capability!